The Panasonic SR-MS103 is more of an updated version of the SR-MS102 rice cooker and not entirely a whole new unit by itself. The desired settings, features & benefits, and timer options seem to be identical as is the entire look and feel of the unit. Why Panasonic updated this already very good unit with a simple “3” at the end of the model number is probably more of a marketing approach than anything. The unit keeps the advanced fuzzy logic technology to monitor temperature and cooking time and binchotan-type charcoal pan resulting in very high quality rice dishes that have enhanced aroma and flavor superior to that of older plug and set cookers. It also sports a convenient 24 hour preset timer for selecting an approx. finish time along with a 12 hour keep warm mode (not recommended for brown rice). Just like its predecessor, the SR-MS103 rice cooker and slow cooker produces very high quality rice allowing users a range of several rice type settings that are preprogrammed into the unit’s onboard computer. These diverse settings include: white rice, brown rice, and sticky rice, along with a quick cook setting, (lowered rice quality). In addition, this Panasonic rice cooker offers a slow cook setting for up to 12 hours, a porridge setting, a food steaming setting, and a cake baking setting. For it’s price this cooker does a lot and remains favored as a great multi-purpose cooking machine to have in the kitchen. The only thing it does lack is a specific sushi setting, (not so much the same as the “sticky setting”), an option for selecting different textures for white rice, plus high and low temperature slow cooking controls as found on the slightly more expensive Sanyo ECJ-HC55S model. 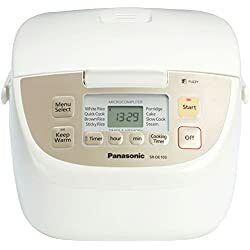 The Panasonic SR-MS103 comes with a 5 cup capacity bowl which is good for yielding around 15 cups of cooked white rice, a steam tray, measuring cup, rice scoop, and a detachable cord. Note: The Sanyo ECJ-HC55S has a rewindable cord. Once again, for a cooker that is under the hundred dollar range, overall we feel this new Panasonic SR-MS103 5 cup rice cooker is a good buy for folks who can benefit from the diverse features it offers and can use an appliance that does more than just cook rice. Other good things to point out is that the unit has a good condensation collector, a domed lid design to prevent water from dripping on cooked rice, and a convenient carrying handle for moving/serving on the table. We do wish the cord on the Panasonic SR-MS103 was rewindable instead of detachable though. For something that is less expensive yet offers similar features, be sure and check out digital cookers from Aroma. Want something a little better? Compare to the Sanyo ECJ-HC55S or the new Zojirushi Umami rice cooker.